Ecommerce is very much in the news at the moment, with Rocket Internet launching their month long online promotion across Lazada, Zalora and Foodpanda, ebay launching in Indonesia, and mobile ecommerce projected to hit $2.4bn revenue in Singapore by 2015. Add to that Alibaba achieving $5.75bn online sales in China in one day, and it is clear that ecommerce in Asia is becoming very big, very quickly. Below is a collection of insights covering ecommerce in emerging Asia to help put some context around the buzz. Comprehensive coverage of the online commerce opportunity in South East Asia. Great source of interesting stats. 82 page document containing detailed insight across markets from Indonesia to Korea. A dynamic infographic created by Jana as part of a series covering online trends in Asia. 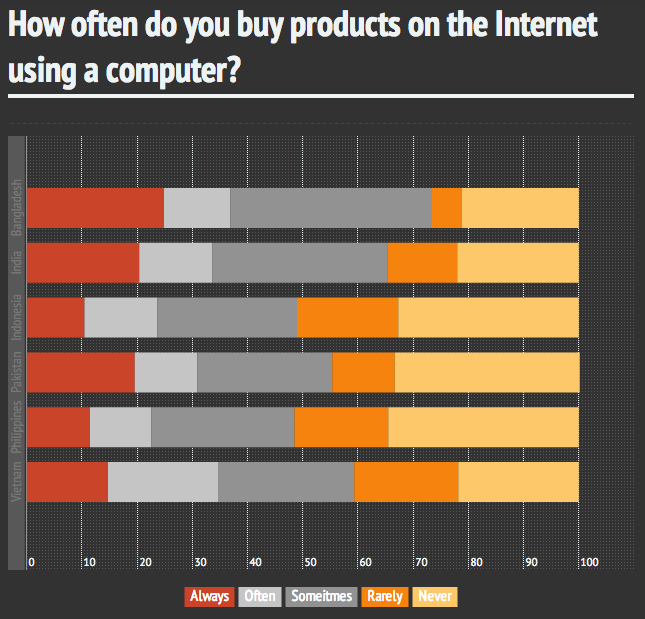 Valuable consumer ecommerce insight, especially for the less developed emerging markets. Screenshot only below, get the full version here. Beyond the above, we would also suggest using our Custom eMarketer Search Tool for the most up to date ecommerce news and research from eMarketer. There is plenty of ecommerce data among the the wider Digital insight. As always, if you have any questions or suggestions for resources we have missed, please let us know. Pingback: 【WeBlog】ASEANのECサイトに関して | WEGLO JAPAN Inc.